CALGARY — A study looking at wildlife crossings along the Trans-Canada Highway recommends up to 10 sites where the measures could save money by reducing collisions between vehicles and animals. Photo credit: Stuart Gradon, Calgary Herald. Researcher Tony Clevenger says the wildlife underpass near Dead Man’s Flats is improving human safety by reducing the number of wildlife-vehicle collisions in the area. And it’s getting the attention of the Alberta government. The report, released Monday by the Miistakis Institute and Western Transportation Institute, looked at a 38-kilometre stretch of Highway 1 between the Highway 40 turnoff to Kananaskis Country and the east gate of Banff National Park. “We know there are hot spots out there when you drive that highway,” said Tony Clevenger, co-author of the report. Based on a set of five criteria, including the rate of wildlife-vehicle collisions and overall importance as a wildlife crossing, it recommends 10 sites along the roadway where mitigation would help prevent collisions and ultimately save society money. Trent Bancarz, a spokesman for Alberta Transportation, said the government is reviewing the report. 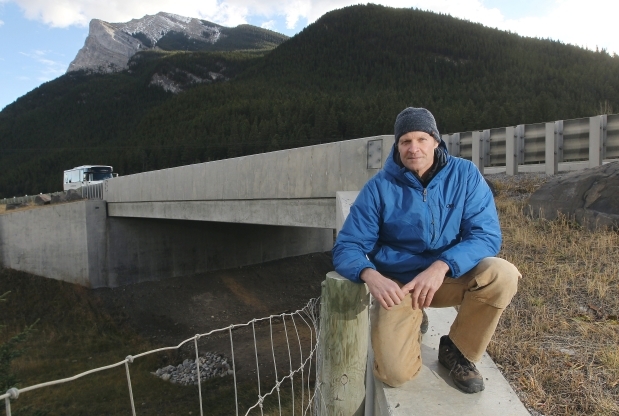 As part of the recommendations to the province, the report looked at an underpass at Dead Man’s Flats near Canmore to determine cost benefits of the wildlife crossings. The analysis of the underpass, along with three kilometres of fencing, found the number of collisions were reduced to three a year. That’s down from an average of 12 since the mitigation measures were installed in 2004. It estimates the overall annual cost to society is reduced from $129,000 to $18,000 because there were fewer damaged vehicles, injuries and deaths. The cost also accounts for lost hunting revenues. He said it makes it clear the measure can work outside of parks and protected areas. Wildlife mitigation measures have been used in Banff National Park for decades, but they haven’t been without controversy because it has cost millions of dollars in highway upgrades and wildlife crossings. Trevor Kinley, road ecologist for Parks Canada, said the measures are working. “Our experience on the Trans-Canada in Banff National Park is that it can make a dramatic difference in animal safety, human safety and landscape connections by putting wildlife crossings in,” he said. There are 38 wildlife underpasses and six overpasses between Banff National Park’s east entrance and the border of Yoho National Park.